Bell’s continuously expanding Graduate Leadership Program provides unique opportunities for Grads to innovate, learn from mentors, and accelerate their careers. Bell: Where did you go to university and what program did you take? 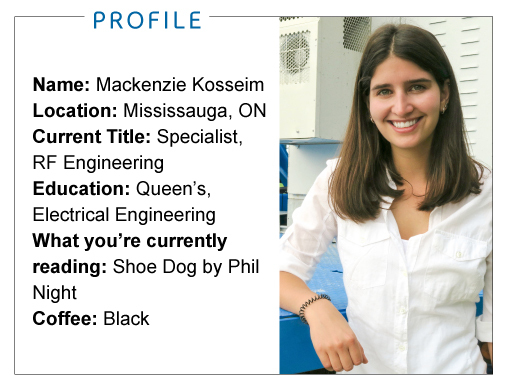 Mackenzie Kosseim: I attended Queen’s University for Electrical Engineering because I’ve always had an interest in technology. The program was a good balance between exploring my passion for technology, while also gaining useful software engineering skills and attaining a well-rounded degree. Bell: Some people believe that Network and Engineering are male-dominated professions. Do you agree? MK: I would agree that there tends to be more males than females, but I’ve never found it to be an issue for me, especially here at Bell. Bell has a great work environment and culture, that puts a focus on supporting people move forward in their careers. Bell: How did you hear about the Bell Graduate Leadership Program? MK: I found it online through my university’s campus recruiting website. As I went through the interview process and learned more, it seemed like an opportunity that I didn’t want to pass up. I got really excited about all the variety and mentorship the program provides. Bell: What are some of the projects that you’ve worked on or are currently working on? MK: Our team recently worked to increase our mobile network capacity at First Ontario Place, a big concert venue in Hamilton, Ontario. Because stadiums hold a lot of people at once, they can experience significantly more cellular data usage. We basically designed a system that helps our network share the cellular signal more effectively during times of high traffic, which means our customers can upload their Instagram stories and text friends during games and concerts without issue. I also got to attend the Maroon 5 concert after we finished our implementation to make sure everything was working well, so that was definitely a nice perk! Bell: How does it feel to go to these really cool events for work? MK: It’s awesome! 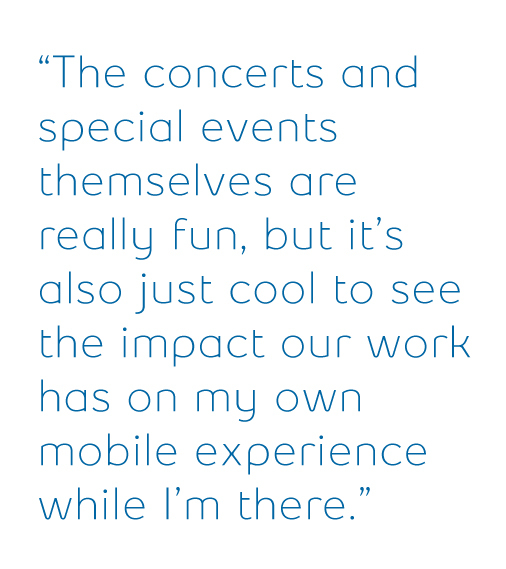 The concerts and special events themselves are really fun, but it’s also just cool to see the impact our work has on my own mobile experience while I’m there. There’s no better way to understand what a user is experiencing than to be physically at an event, posting a Snapchat when Maroon 5 comes on. By understanding what the user is experiencing, we can improve it. It’s amazing being a part of that improvement process. Bell: Do you have a favourite project you’ve worked on? MK: I would say it’s a tie between optimizing our network at Burl’s Creek for the WayHome and Boots & Hearts festivals and using drones to track user experience at Toronto’s BMO Field. The BMO Field done project was definitely very unique. It was the first time in Canada that a communications company used drones to test a mobile experience in a stadium. It required a lot of creative thinking and came with a lot of challenges. We had to find a unique way to mount our equipment, which gathers data on signal strength and user experience, onto a drone. But the drone could only hold so much weight, so that was a challenge. The project had a big impact. To test a stadium’s user experience in the past, our team would have to walk up and down the bleachers carrying the equipment ourselves – but by using a drone, we could cover far more ground, faster. At Burl’s Creek, we deployed the Lens Antenna for the first time in Canada. It’s basically a massive ball-shaped antenna that provides enough mobile capacity to handle the number of smartphone users at big, special events. We also deployed the antenna on a trailer so that it’s mobile, which means we can place it at other events in the future. This means we can provide the best mobile service at different events across the country, like music festivals, by driving the antenna to new locations. Bell: What advice would you give to someone who’s looking at applying to the Graduate Leadership Program? MK: Bell is a great place to start your career! I’ve been offered a lot of opportunities to develop both my technical skills, as well as my interpersonal communication and leadership skills. You’re put in a wide range of situations and you get hands-on experience. There are a lot of changes going on in telecommunications and Bell is constantly transforming and innovating in response, which is exciting. By joining the Graduate Leadership Program, you’re part of a group of new talent whose ideas are valued, which means you have a chance to really drive change. Interested in our Graduate Leadership Program? Learn more here!